Are you tempted to upgrade your 360 pad? Razer has today announced the launch of a brand new 'elite gaming controller for the Xbox 360' – the Razer Sabertooth. Available initially only in the UK and USA, the control pad looks similar to the official Microsoft 360 pad, but features six additional buttons which you can map to your specific needs with the help of the built-in OLED screen. Two of these buttons reside on the shoulders while two removable rocking switches live on the undercarriage. The Sabertooth pad also has a fully detachable cable that screws onto the controller, and comes with a carry case for ferrying your pad round to your mates' house. 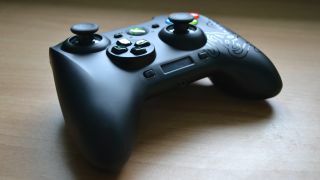 TechRadar has been testing the new pad over the last few weeks - we like that it retains all the things that make the Xbox 360 pad design the best out there, while adding extra functionality to push it over the top. But at £69.99/$79.99 is it worth buying? You'd probably best read TechRadar's Razer Sabertooth review to find out!